Despite being one of the windiest states in the nation, North Dakota is far behind some of its Midwestern neighbors in developing wind power. But it could be getting a big boost of clean energy: it was announced recently that a huge 2,000 megawatt wind farm is planned for the northwestern part of the state. Developers hope the $4 billion project will begin construction in 2010. Eventually, 1,333 wind turbines would cover three counties and 720 square miles. It will be one of the world's largest projects - for now: Texas oilman T. Boone Pickens, is planning a 4,000-megawatt wind farm across four counties in the Texas Panhandle. But there's one missing link in the ND project and so many other planned wind farms: New transmission lines are desperately needed to move the power from the prairie to more densely populated areas. The permitting, planning and construction of the lines take years and are already slowing down other wind projects across the Midwest. So therein lies the huge gap in our plans for more wind power - the ability to efficiently site, permit and construct new transmission lines. And the lines - especially the large ones - are not popular in some communities. But this Not in My Backyard (NIMBY) syndrome threatens to slow down the greater good of clean energy projects that pump millions of dollars into the local economy, reduce our dependence on fossil fuels and don't spew global warming emissions. 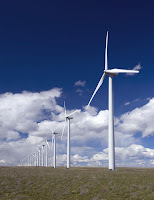 There's a saying: "If you love wind power, you have to like transmission." Io credo invece che l’uomo in passato abbia già sviluppato la tecnologia necessaria a separare i due gas e la piramide di Cheope non è che un esempio di impianto di biotecnologia.